I'm sharing a card made using the Dutch Doobadoo Shape Triptych 2 for the base of the card. 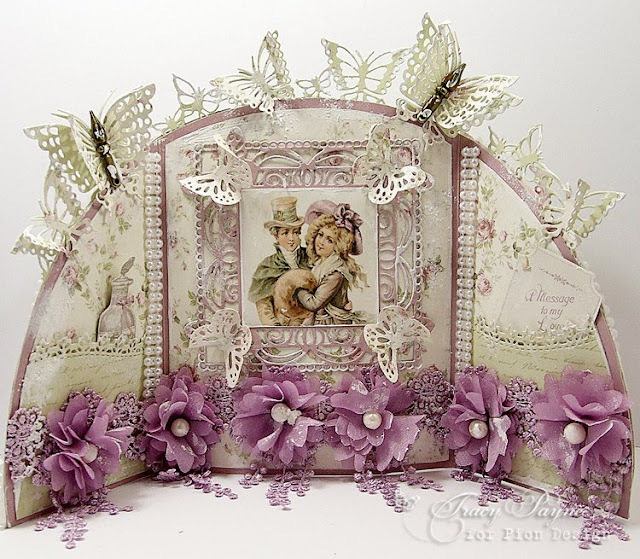 The gorgeous papers are by Pion Design "Where the Roses Grow Collection", so very beautiful. The image is from the "Images from the Past" sheet in the same collection and framed with a Joycraft Butterfly frame diecut from the Pion Pallette. I edged the sides using double row pearl. I added butterflies all around the edge using the Joycraft Butterfly edge die and cut using the Pion Design papers and added a pen nib to the largest butterflies. I used the Marianne Design Wave border to create pockets either side and popped cut outs from the tag sheet. The lace is Lace Gwendoline in purple, so gorgeous. I added a little gesso for the shabby feel. We are setting up today for the Stampermam Show at Stevenage, if your going, pop by and say hello. Good morning Tracy, oh I love these Lace Gwendoline so much. Fantastic papers, butterflies and pearl trims. The Bronce Pens are looking beautiful too on the butterflies, great idea. Stunning creation.